On behalf of the Board of Trustees and Search Committee of the American International School of Nouakchott in Nouakchott, Mauritania, we are pleased to announce that Ms MaryAnn Przekurat has been appointed the new Director beginning in August 2018. Ms Przekurat was most recently Executive Director of The Literacy Center in Allentown, Pennsylvania. She has held other administrative and teaching positions in Ghana, the Dominican Republic and Saudi Arabia, as well as in the USA. She also held a Business and Operations Manager position in Uganda earlier in her career. Her husband Dave is also an educator. Their children are now grown and are pursuing their own careers in international education. Ms Przekurat earned an MA in Finance from the University of Iowa, an MBA from Lehigh University in Pennsylvania, and a BS in Mathematics from the University of Vermont. The Board of Trustees of the American International School of Nouakchott, the AISN Search Committee and Search Associates would like to thank all candidates who expressed interest in the Director position, and to everyone who assisted and supported the search process. The American International School of Nouakchott (AISN) is a non-profit educational organization that was founded in 1978. 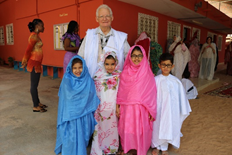 The school faces the exciting challenge of growth in coming years from the increase in both expatriates and Mauritanians applying to the school. Students come from a variety of countries including the United States and many nations in Europe, Africa, and Asia. Enrollment at the school has varied from 70 to 90 students in the past five years and is presently at 90+ students. AISN graduated its first senior in June 2011. Subsequent years each graduated 3-5 students. Recent graduates have attended universities in various countries – including the United States, Europe, and Asia. The school is located on the grounds of the United States Embassy, allowing it to benefit in terms of security and logistical support. When the US Embassy moves to its new complex, we will stay on our present site. AISN currently has 16 members on its professional teaching staff as well as a K-12 school counselor and 2 co-curriculum coordinators. The school was built in 1978 and houses thirteen classrooms for grades Pre-K through 12 - including a science lab, an art room, a computer lab, a music room and a five-thousand volume library. Recent renovations have included additional office spaces for our Administration, Business Office and Counseling Program as well as extra shaded areas around the school. AISN is a member of the Association of International Schools in Africa and works with the Office of Overseas Schools of the U.S. Department of State. The school is fully accredited by Middle States Association of Colleges and Schools from pre-K – grade 12 through 2021. The AISN curriculum is based on the American Education Reaches Out (AERO) Standards and is similar to American public schools. AISN uses the Measurement of Academic Progress (MAP) computerized standardized assessments developed by the Northwest Evaluation Association to provide the same kind of assessment that students in the U.S. take annually. 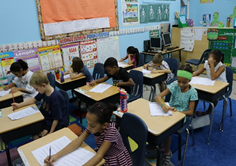 Writing skills are determined using the ERB Writing Assessment Program (WrAP). Furthermore, AISN is a member of the West African International School Athletics League (WAISAL) that provides students a chance to compete in a variety of sporting activities with member schools. >Mauritania is a West African country on the edge of the Sahara with a unique mix of Arab and African cultures. Nouakchott is the capital of Mauritania and is a small city of less than one million people. Mauritania's climate is hot and arid, except in the far south, which has higher humidity. In Nouakchott, daytime temperatures reach 85°F in the winter, although at night sweaters and blankets are sometimes needed. Summer temperatures regularly reach over 100 °F during the day. It is usually a dry heat that most find more bearable than the same temperatures with high humidity. Overall, crime in Mauritania is not unlike crime in any major city in the U.S. A number of terrorist and/or armed groups are or have been active in the Sahel region to which Mauritania belongs. However none of them has been active in Mauritania in the past years. The most recent attack in Nouakchott was in August 2009. There have been other attacks committed against Mauritanian military targets, usually in remote locations in the Mauritanian desert (most recently in 2011). The Mauritanian government is very proactive toward terrorism and is vigilant. It desires to protect its citizens and Westerners alike. The U.S. Embassy has many families and children in country and has determined that Mauritania is safe for these groups. Mauritanians speak French and a local dialect of Arabic. Knowledge of French is helpful. Nouakchott is a small city, easy to navigate and nothing is more than fifteen minutes away. Weekend afternoons at the beach are a main source of recreation. There are several beaches within twenty minutes of the school that expatriates regularly use. Nouakchott is on the edge of the desert and treks over the dunes and camel rides can be easily arranged. AISN offers an accredited American international education committed to excellence, achieved through a partnership with the AISN community to prepare our students for admission to universities worldwide, transfer to other American/International Schools, and to public or private schools in the USA. The AISN Board of Trustees consists of five voting members elected for two-year terms from the parent community. The US Ambassador appoints a non-voting Ambassador's representative who also sits on the Board. The Director is also a non-voting ex officio member of the Board. An understanding of the important issues facing the school in the next few years and the ability to lead AISN to address them. 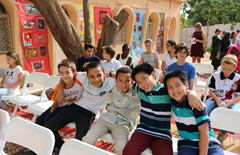 American International School of Nouakchott (AISN) has appointed Search Associates as consultant in the search for a new Director with Ralph Jahr and David Cramer being the lead consultants. The deadline for applications is 19 January 2018. Candidates are asked to submit a letter of interest and the requested materials as early as possible as the Search Committee/Board of Trustees reserves the right to close the selection process at any time if the right candidate is found. The review of files will begin as soon as applications are received. The Search Committee will select finalists by 31 January 2018 or before. Skype video interviews of finalist candidates with their spouses, if applicable, will take place immediately after the finalists have been identified by the Search Committee and the Board of Directors. The new Director will be selected immediately after the interviews of the finalist candidates have been completed. Additional information about the American International School of Nouakchott can be found on the school's web site at aisnmauritania.com.